Want to have fun and do good? Only RM50 and you can contribute towards the Belum-Temengor Campaign while grooving to the beats of jazz, pop and even a nose flute. Featuring Markiza & Peter Hassan Brown, Jojo Struys & Tugu Drum Circle (6 virile percussionists and a lady from Lebanon was it, who could beat the drums and dance to send shivers up your spine), Indigenous musicians from Semai on drums and flutes, Jyoti (on djembe) and his Tap Dancing partner and a Malay Asli group who kicked off the entertainment about 7.30 playing well-known songs in traditional style. Freebies were given out and there were auctions of souvenirs to tempt the orang kaya to open their wallets which they duly did (see below). In 2006, Malaysian Nature Society launched the Belum-Temengor Signature Campaign in order to petition for the protection of Peninsular Malaysia's largest tract of contiguous forest area. The forest reserve spanning almost four times the size of Singapore is home to tigers, tapirs, elephants, rhinoceros and hornbills. Although the MNS campaign has garnered positive reactions from the masses and local government, there is still much to be done. Do support MNS by attending the first of a series of fundraising events for the Belum-Temengor Campaign. from this function, which was really well organised. PH always has good sound and there were only two of us. Our lead guitarist dropped out so Justin from Tugu joined us for the performance and really made it punchy. The Polar Bear song was commented on favourably but I'm not sure whether people weren't bored by two many rather bleak and pessimistic environmental songs. Next time remember to do at least one happy up-tempo song. The food was absolutely great. We recommend this venue for your next annual gettogetherwhatever. MARKIZA performed songs from the early Joni Mitchell songbook (literally she had the book open in front of her while she played because she reads dem notes - not like ignorant street musicians like me). At No Black Tie, 17 Jalan Mesui, Kuala Lumpur, behind the Istana Hotel. I gave her a little bit o' rhythm guitar from time to time, but as promised I remained off stage for most of the show. The excellent musician and percussionist Zalila Lee helped out with a small djembe. Furthermore Rafique Rashid did a cameo performance of two songs by JM, Coyote and Pork Pie Hat - this last a song by Charles Mingus with words by JM from her "Mingus" tribute album. May 1st THURSDAY (public holiday). There'll be ENTERTAINMENT too - some musicians singer-songwriters (including Peter Brown) will come by - good food - the Nasi Lemak and Kopi O is excellent - guaranteed a good and interesting evening with food for the stomach, ear and mind/brain. 8.00 pm onwards ....... It was a great gig with some excellent bands and lots of fun - very relaxed and easy-going. I played solo - some completely virgin songs such as Salacious Rapacious, Disaster Radio, and some rare ones that I hardly ever perform like Gotta Make d'Music and finally the ode to cyclists song Lesser Being otherwise known as the kiasu song. The event was staged to launch Hishamuddin Rais collection of essays Keganasan, Penipuan & Internet (hegemoni media daulah pecah). Mr Isham made a speech to introduce the evening with an enormous proliferation of a certain word in it, and then the evening just went like rocket ship. There were some nice people we had not seen for a long time, so I thoroughly enjoyed myself!! whoopee!! Friday 2nd May from lunchtime until evening at One Utama Shopping Centre. In conjunction with the Earth Day 2008, Selangor State Government has taken the initiative to encourage more people in getting involved in preserving the environment. A “Green Ranger Wannabe” campaign will be held on 2nd May 2008 (Friday), 2.30pm-6.30pm, at Rain Forest of 1 Utama Shopping Centre. Our honourable Bukit Lanjan State Assemblyman Elizabeth Wong will officiate the program together with Puan Che Asmah, director of Department of Environment. What to do with the Green Ranger? The Selangor Environment Department is now collecting a number of names, people who would like to become Green Ranger in the sense of volunteering in the coming activities organized by the respective department and NGOs. Those who have subscribed in becoming a green ranger on that day, are entitled to bring home a small pot of green plant. There are about 400 plants sponsored by a nursery from Sungai Buloh that will be given away. As a matter of fact, Selangor is a so called developed state, but the awareness among the public regarding preserving the environment, is still discouraging. YB Elizabeth Wong, also the EXCO member of Tourism, Consumer Affair and Environment, hopes the public will start preserving the environment on a daily basis in their life. YB Elizabeth will also announce about her community service centre during the campaign. With the existent of a service centre, she pledges to be with the rakyat, and resolve problems together. Other activities such as drama, screening and art performances will be part of the campaign as well. All are invited to the campaign. Special Assistant, Ms Chua Yee Ling (012-7355025, bukitlanjan2008@gmail.com) or Event Coordinator, Ms Chua Sze Chuin, (012 -7577335 or DL: 77223576). including Markiza & Peter Brown . This time we had Rohnie the violinist to help us out with Searching For Love, Sad Tomorrow, Listen 2 What U C and the Polar Bear song (we still have not recorded this song which is designed to have slide guitar, but Rohnie's violin, very sweet and mellow added another dimension of sentiment to the song - thanks so much Rohnie (who plays with the excellent band Milli'z). This event was a real festival. Rare chance to see this duo perform in London: a showcase of songs by Markiza (vocals, keyboards) and Peter Brown (vocal, guitar, harmonica). 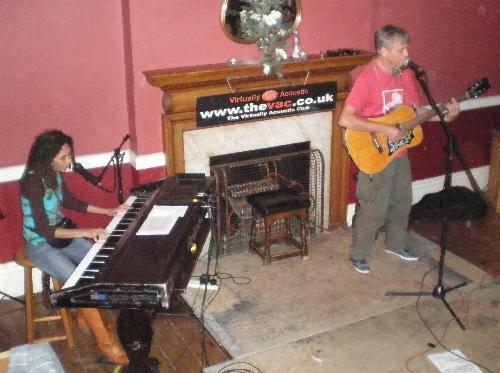 PB started writing and performing songs in the 70s, made 3 albums (now remastered on CD), then met M and they made 2 as a duo, another as a band Soft Touch and a 4th solo (Warm) see www.lemang.com for dtls. They have some new songs now to preview so catch their act in London (they live in Malaysia but just visiting UK for a month) If you like pop/bluesy/alternative acoustic music with messages about things like peace, environment, human rights then you will enjoy this evening's performance. 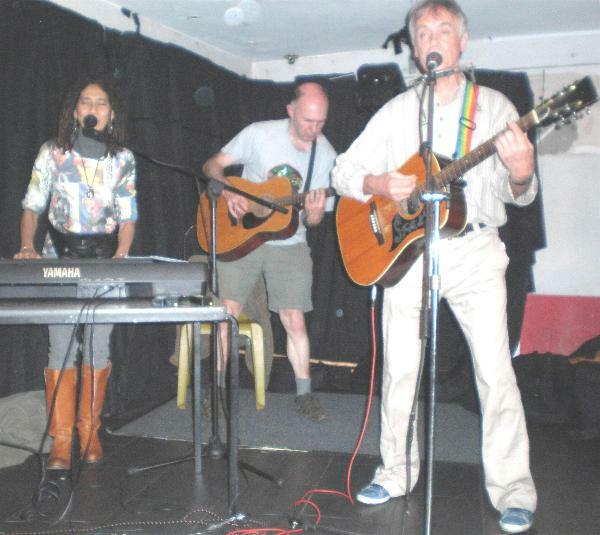 Yes it was a good gig, thanks to the beautiful David Sherwood who got the venue, provided the equipment and did the excellent sound, Michael Dunnigan who sat in on 3 numbers and Phil Davies who also played on some numbers. Thanks to all who took the trouble to get there and last but not least to Silver Sam & Anna Giles for doing such a fine first set. Wish I'd recorded it. 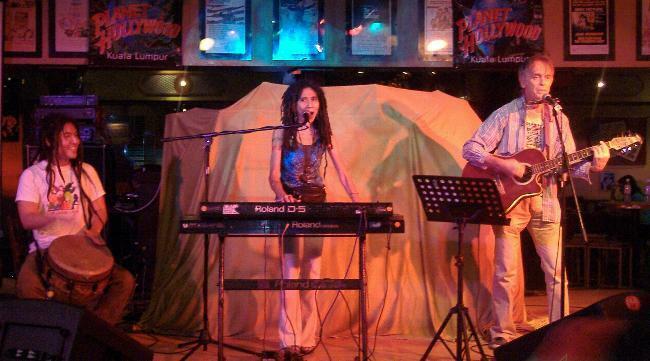 Featuring Markiza (vocals, keyboards) and Peter Brown (vocal, guitar, harmonica). PB started writing and performing songs in the 70s, made 3 albums (now remastered on CD), then met M and they made 2 as a duo, another as a band Soft Touch and a 4th solo (Warm) see www.lemang.com for dtls. They have some new songs now to preview so catch their act in London (they live in Malaysia but just visiting UK for a month) If you like pop/bluesy/alternative acoustic music with messages about things like peace, environment, human rights then you will enjoy this evening's performance. David Knight Nan Blues Peter Hassan & Markiza with Rohnie Tan (violin) Panda Head Curry? well the special guests couldn't make it but the evening was pleasant and M sung and played well (and PB added some rhythm guitar on certain songs like Help Me and some bv and harp on other songs like Big Yellow Taxi. Quite a few people turned up and while some left early others stayed til end and told us they really enjoyed the show. What more as performers can one ask for? (Happy Birthday George). We performed five songs and George and Nurul did the sound which was very good, so I sang in tune and Markiza too. People seemed to like it, especially the song "Like a Polar Bear" we were playing with Rohnie on the fiddle this time. we also did Sad Tomorrow, Searching For Love, A Friend Like You (Markiza singing it in D), and Listen 2 what U C which is sounding really good with Rohnie's Stephane Grappelli like playing on the choruses. Thanks Rohnie. More than 40 stalls selling paintings, T-shirts, homemade accessories, recycled sculptures, and arty cenderahati merdeka, with all items priced under RM100 each! Participating artists include Munkao, Shahril Nizam, Saharil Sahrin Sanin, Fathullah Luqman, Jacqueline Ann Surin, Danny Lim, Erna Dyanty, Lisa Foo, Gerai Orang Asli and more. This was a Monday night no cover charge gig and we played the whole evening, along with ... well we had asked tentatively a few guys to come and jam on one or two songs, and thanks guys - they came and we played some covers and some originals for the whole of the second half. For the first half we performed some arranged and rehearsed songs from Joni Mitchell, Stevie Wonder, wes Montgomery, Chick Corea, Carole King, Manhattan Transfer - jazzy sort of stuff. Mar performed alone at the piano for a few songs, some she has never before played in front of an audience (unless you consider me an audience in our living room). We also played some originals. 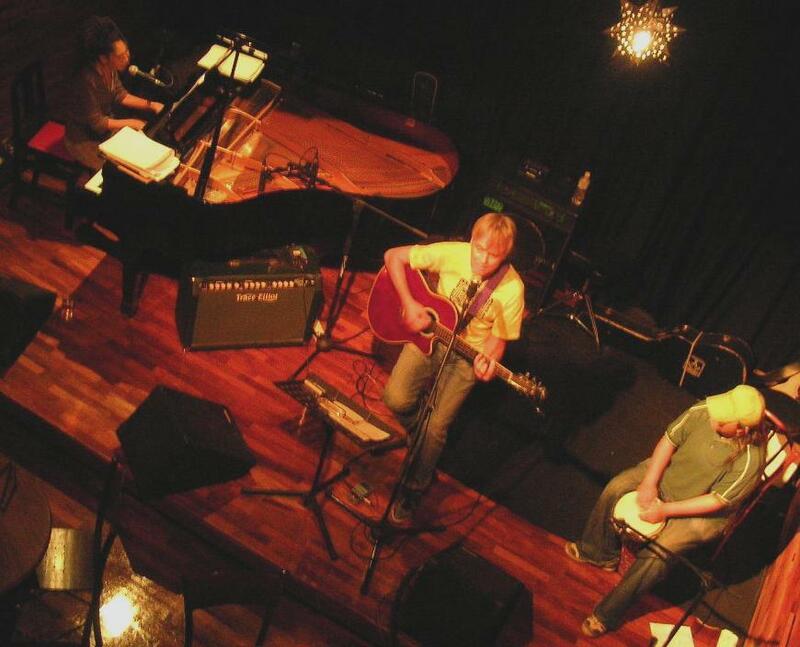 Saturday 18 October: MOONSHINE: a homemade acoustic show. Markiza & Peter Hassan Brown, Wani Ardy, Reza Salleh & Azmyl Yunor. Apartment (Upper floor) Suria KLCC, off Jln Ampang, KL 9.30pm - Free Admission. Relaxed and laid back show featuring singer-songwriters presenting their own material in honest and unpretentious style, in comfortable and spacious restaurant facing the KLCC Park. This was a relaxed sort of affair with the charming Wani Ardi, unblemished Reza Salleh, and winsomely humorous Azmyl Yunor and then there was us. Good response, nice pasta ... what more can one say ... ? 30th October Acoustic Vibe at Marketplace Cafe, 4A Lorong Yap Kwan Seng, Kuala Lumpur (opposite Restaurant Stadium Negara along the road from the Australian High Comm). Featuring: Reza Salleh, Rendra Zawawi, Markiza & Peter Hassan, Trent Williams, Izzy Mohd. 9.30pm. RM20 + 1 drink Trent Williams is a singer/songwriter from Perth, Australia.Trent released his debut EP Holding on to You on 10 March 2008. Since the release he has performed in many venues and festivals around Australia. 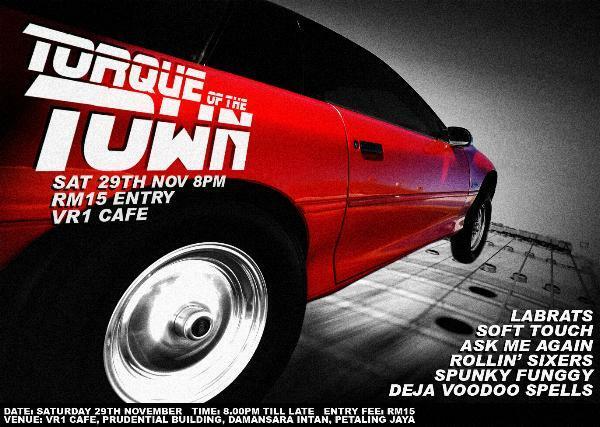 Saturday 29 November: TORQUE OF THE TOWN featuring Lab Rats (winners of Global Battle of the Bands 2008!!) Spunky Funggy, Rolling Sixers, Soft Touch (special one off performance), Deja Voodoo Spells, Ask Me Again (in place of Rendra Zawawi). Cafe VR1, Prudential Bldg., Damansara Intan, Petaling Jaya (on left on way to NKVE from D'sara toll just before the flyover) 8.00 pm until late. admission RM15. This seems to have been a very good gig judging by the feedback we have been getting, and the joyous and contented atmosphere of conviviality and audience appreciation that the performing bands received. Thanks to all the bands and to all of you who turned up and enjoyed yourselves, who came to lap up the cream of the music scene in KL Thanx.. 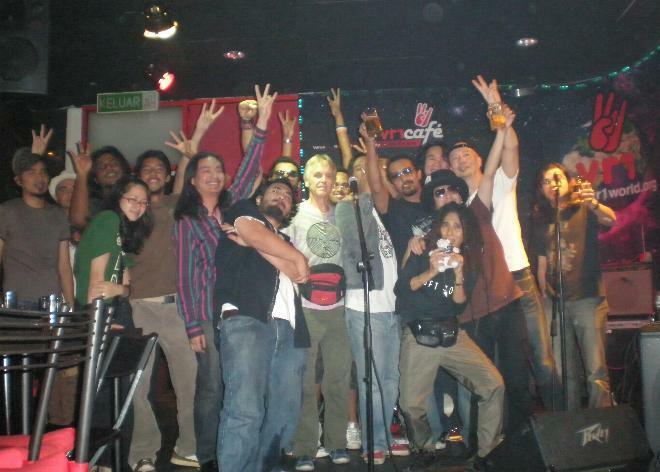 Almost 60 people paid the 15 ringgit which meant that bands could take home a little less than RM150. Thanks to Aleel who did the sound expertly and above all thanks to the owners of VR1 Thomas, Kenny & Jeff Siah for letting us use your premises - the VR1 Cafe - and sound system - Jeff, late of Positive Tone - came along to cheer us on and make one or two appropriate suggestions. thanks also to Lohan who displayed exempliary enthusiasm employing not only voice but arms and legs to do so. We - that is Peter Hassan Brown and Khai Bahar - are very satisfied with the result and we are sure there will be more gigs to come at this venue, whoever organises or plays in them. Ask Me Again were first on the stage (well, not really a stage but that was no problem - as long as the floor doesn't move about while youre playing that's usually ok) and they stoked the fires of dramatic rock, with Hameer Zawawi singing in his fine baritone reminiscent of some eighties bands while the guitarists zig-zagged with precarious and tortuous riffs. Then there was the famous (or maybe infamous) Spunky Funggy with the original drummer Chong and a new bassist backing the always humorous, good-natured and entertaining Wolf who we don't get enough of - that pungent real loud E-major siguing into hectic punk, with a sample of both his newer singalong stuff and older numbers from the treasured album Smile For The Revolution. Then there was ... Soft Touch. Well, thanks to Alda, Wong and new guest drummer Kevin Theng (doing his 'theng') who made our rather drab music into something that people were really grooving to (someone told someone they could actually hear my words - I mean how uncool to hear what a rock band was singing! - but then we're not really a rock band, come on are we? At most folk rock? But then Listen is quite fast and stomping. And then there's Better World and Wishful Thinking - We're almost skar reggae ???) Then came - well as if from out of the bowels of an earthquake enraged Earth - the Rollin' Sixers - blues that reminds one of Captain Beefheart or early Rolling Stones when they were still playing in the clubs - delicious wailing bluesharp playing. They finished up with Satisfaction by that band. After that: The Lab Rats this time with six guys or five and the lovely Shahirah - a sort of reborn Jefferson Airplane in their early more folky days - some four part harmonies on the vocals were really delicious and songs that really cut the ice with sturdy rock backing - no wonder, I was thinking, they won the CBOB Malaysian chapter. And finally ... The apotheosis of ton weight, fast arpeggio rock, breathtakingly integrated rhythmically complex patterns of guitar, bass and drums - Deja Voodoo Spells really showing us all how to do it, with a morsel of Queen and Deep Purple thrown in to please the pubnics. 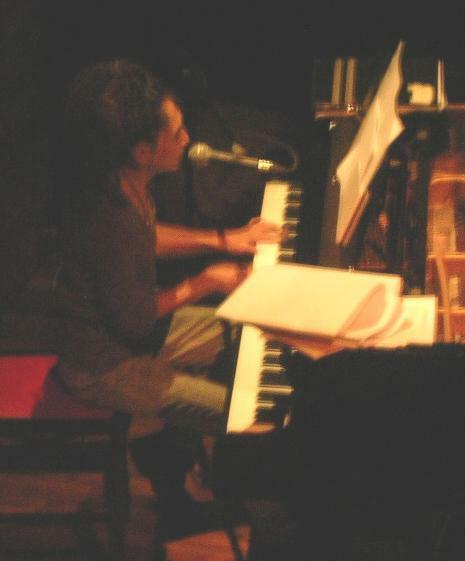 The planned format of this gig - courtesy of Reza Salleh - was Songwriters' Round, with 3 sets of 3 musicians on stage, taking turns to perform a song (or number). As the date of this gig drew nearer and there was no sign of an improvement in our health following the contraction of a particularly nasty and tenacious virus which rendered Mar incapable of anything so adventurous as singing, it looked like we should either ring the gig organiser and come clean or I would have to step into the breach dear friends and do the singing all on my todd as a soloist like a solo Peter Brown gig with M as a session player, seated at the NBT's grand plonking unobtrusively. And that's how it turned out to be. The virus had compressed my own voice to a mere octave of lower growlies, which further drastically reduced our repertoire. So, still wracked by flu with bunged up and squirting nose and voice like sandpaper we ventured forth, telling all those we met to keep at a distance from us - which rather punctured the bonhommie. Having sucked a succession of Fisherman's Friend my voice actually improved and by the end of the evening when we emerged on stage it was doing it's thing if rather coarsely. But then there was the guitar sound on stage (very shrill), the low volume of my voice compared with it (no body), and my ineptitude with the guitar that I had to contend with. Playing in E which was the key of the first song (Golden Moonbeams) means that the relative minor chord is 4 frets up. But if you look down to make sure you've made while singing it then your voice is no longer in front of the mic. Don't know how I got thru this one (forgetting one line of words and rushing to get them in at the last minute). Luckily Sherry picked up the song and Nizam and they played along (thanks guys). Then it went to Zalila Lee for her contribution and finally to Sherry and Nizam his percussionist. Our second song was Night Time and this saved things because the lyrics are very simple and small in number and there's this harmonica which always serves to distract people from noticing how bad my guitar playing actually is, and now matter how over many years you've practiced some routine until it is perfect in the living room when there's no audience, on stage with all those people (NBT was packed) the fingers just won't play. It's just strumming and wailing. Zal then did a fine funky thing and Az played Jazz solo on top of her skatty rhythm - it was great - and Sherry - well he's just brilliant and fast and very well rehearsed with Nizam. Our last song was Open Mic and I made a superhuman effort to remember and concentrate on the lyrics, pronouncing them very precisely, while playing this cod claw-hammer. There was laughter when I sang "some of them are boring, others far too long" (referring to the songs that all these benighted open micers played) but I didn't allow audience reaction to distract me, so I got through it complete with harmonica solo without error, then let Sherry do a solo over the last repeat of the chordal routine. I thought "oh thank goodness that's over" - but then they wanted us to do an encore! I couldn't think of what to play, and started on Contradictions, but got into a muddle over the lyrics because although I'd rehearsed it with Mar the day before it was not enough! So then disregarding Mar I just played this blues by Juke Boy Bonner called Blues Man. Stupid me, I was all uncoordinated by this time, and having taken off the guitar I was not wearing the strap so the ovation style guitar kept turning up preventing me from playing. It was real chaos. I just sucked and blew away on the harp. But people seemed to have enjoyed the whole triple set, folk were nice to me after it was all over (thank you very much). It was a fine evening with some good performances all round (even ours was not all that dreadful until the end).